The prostate cancer market has become saturated in the metastatic castration-resistant prostate cancer (CRPC) setting; the approval of second-generation antiandrogens, radiotherapies, and chemotherapies has resulted in a great deal of development targeting earlier stages of the disease. Interviewed payers in the US and five major EU markets (France, Germany, Italy, Spain and the UK) express concern surrounding the significant and rising cost of prostate cancer treatment. Payers highlight the large and growing epidemiology of the disease, as well as the rising costs associated with the use of expensive novel anti-androgens in earlier treatment lines. These early treatment lines include non-metastatic castration-resistant prostate cancer (nmCRPC) and metastatic hormone-sensitive prostate cancer (mHSPC), which not only represent larger patient numbers than metastatic castration-resistant prostate cancer (mCRPC), but also require significantly longer treatment durations due to longer life expectancies and slower disease progression. Zytiga is likely to gain positive reimbursement recommendations for high-risk mHSPC patients across the US and EU based on positive overall survival results demonstrated in the Phase III LATITUDE trial. 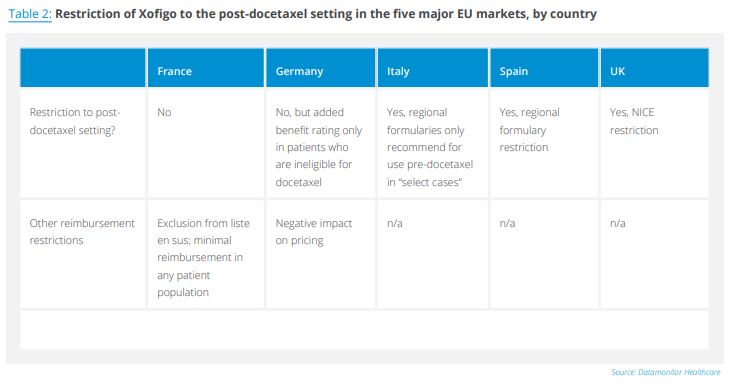 However, as docetaxel has also demonstrated similar improvements in this patient population, Zytiga might face significant pricing pressures if health technology assessment and reimbursement agencies decide to conduct comparisons against the cheap chemotherapy. Zytiga’s main advantage lies in the fact that it is much better tolerated compared with docetaxel. Therapies looking to gain approval in high-risk mHSPC or mCRPC will likely experience downward pricing pressures if they launch following Zytiga’s patent expiry in 2018 in the US and in 2021 in Europe. 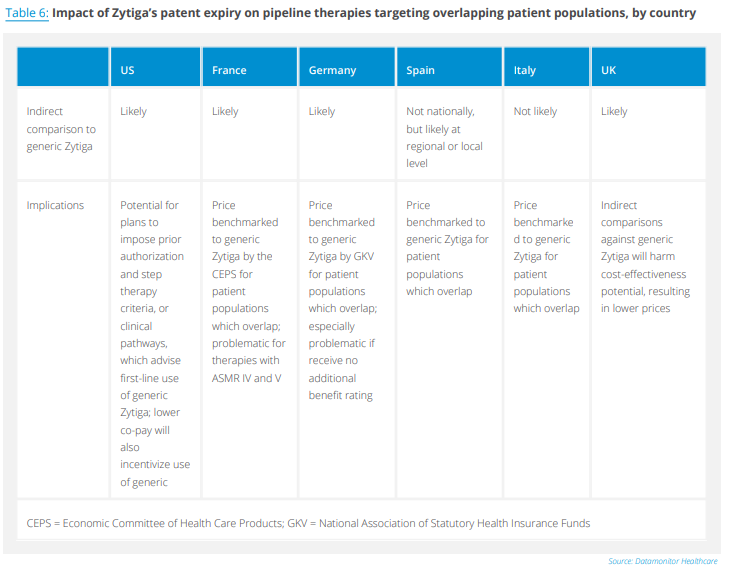 Health technology assessment and reimbursement agencies across Europe may either utilize Zytiga as an indirect comparator in these patient populations, or use generic Zytiga as a cost benchmark during pricing negotiations. Although payers highlight the value of delaying metastasis in nmCRPC, there is a limit to how much certain payers are willing to pay for these improvements. In France, therapies with only metastasis-free survival (MFS) data are unlikely to gain an ASMR better than IV, which will likely result in downward pressures from the pricing commission. While the Federal Joint Committee in Germany is slightly more lenient towards MFS, and significant improvements could result in a minor additional benefit, payers still expect these therapies to experience significant pricing pressures following approvals. 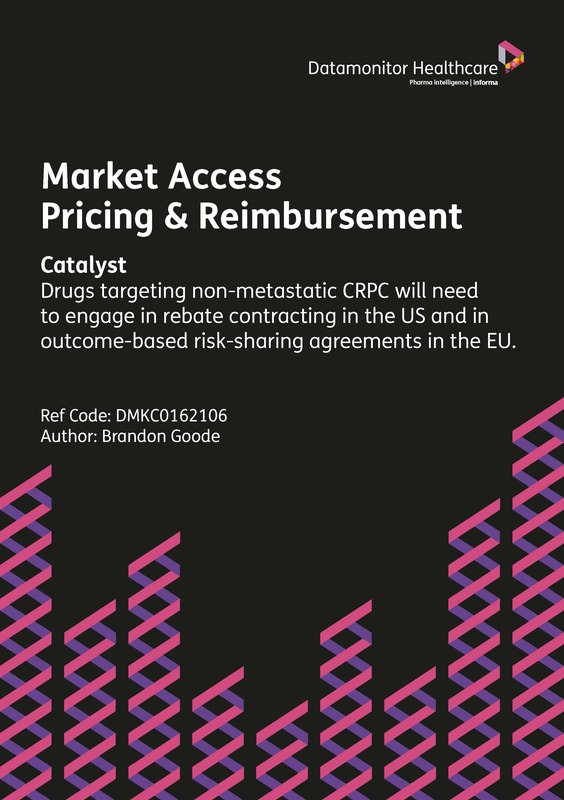 In the UK, nmCRPC therapies will likely need to lower their prices to address the uncertainty associated with MFS endpoints. Post-launch sequencing studies will be extremely valuable in convincing payers and physicians of the benefits of a therapy, especially as competition in the nmCRPC and mHSPC populations heats up. However, payers and key opinion leaders recognize the challenges with obtaining these data due to the growing complexity of the treatment algorithm, and the requirement for long-term studies. Instead, intermediary endpoints such as PFS2 and time to subsequent chemotherapy, as well as real-world evidence data, could be utilized to convince payers of the value of early treatment. Furthermore, this type of data could help to alleviate concerns about cross-resistance reducing the efficacy of sequential use of next-generation anti-androgens in more advanced treatment lines.